All St. Joseph athletes are required to have a yearly physical and the appropriate forms on file with the school office prior to participating in any sporting practice or event. The required forms, located below, include the medical release form, the athletic commitment form and the Diocese physical form. Please click on the Athletic Handbook tab to the right and read the athletic handbook before signing the athletic commitment. Coaches are vital to the success of our sports programs, and we welcome volunteers. Please fill out the prospective coach’s form and return it to the school office. In order to be considered for a coaching position, all volunteers must be screened and cleared through the Diocese of Dallas Safe Environment Program. Click here to learn more about this program and to access the link for new volunteers. 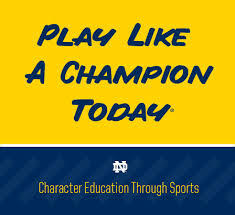 Our coaches must also participate in the Notre Dame University’s “Play Like a Champion” program, sponsored by the Dallas Parochial League. Coaches are only required to be “Play Like a Champion” certified one time. This certification does not need to be renewed. Please visit the DPL link here for program dates.